Sound originating from motors, pumps, compressors, generators, people, and road noise can be problematic, even when separated by a wall or enclosure. When noise can’t be controlled at the source, the use of a barrier or barrier/absorber combination is generally required. The addition of an acoustic sound barrier to lightweight acoustic insulation enhances its performance at stopping noise from transmitting through, especially at lower frequencies and when space for insulation is limited. Heavy vinyl acoustic sound barrier material for blocking sound transmission, either alone or in combination with an absorber. NEW! Panelzorb NVR-10 is a recycled barrier/absorber combination with a 1lb/ft2 density that costs less than traditional foam/septum products. Sheets or efficiently fabricated parts available with facing and adhesive options. Insul-Fab offers multiple acoustic sound barrier products for the reduction of noise with barriers and barrier/absorber combinations. We are pleased to offer Panelzorb NVR-10, a recycled barrier/foam homogenous combination. Plain acoustic noise barriers may be 1-2 pounds per square foot of mass loaded vinyl. 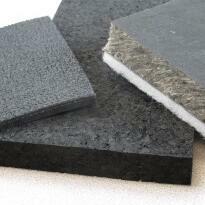 Other combinations of fiber, foam, and barrier are available, as are pre-fabricated parts and covers. 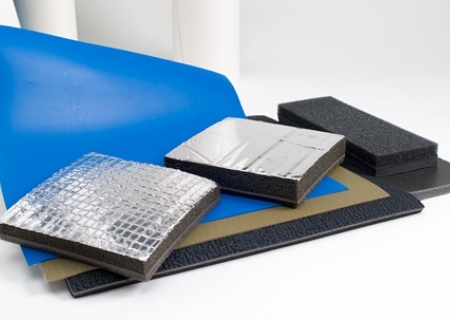 Learn more about acoustic insulation blankets & covers here.